Red light therapy has of late become a very popular way of treating a variety of conditions. It is being used to treat joint inflammation, muscle aches, and tissue damage, and more! And research is finding more usage for it. Recently, red light therapy has even shown very good results in treating pain resulting as a side effect of cancer treatments like chemotherapy or radiation therapy. It is safe to say that red light therapy is becoming more and more proven by the day. What has made red light therapy really popular as a choice of treatment is that it has been approved by the FDA, as a treatment for joint pain and wounds that heal very slowly. The FDA approval for the treatment method has meant that there have been a number of medical grade manufactures who have come up with home use devices to let you perform this treatment at home. This article will guide you through the process of understanding in buying the best red light therapy device out there. Red Light Therapy: What Can You Treat With It? How To Choose A Red Light Therapy Device For Yourself? My Recommendation For The Best Red Light Therapy Device Out There? Don't feel like reading 2,851 words? I recommend getting the TENDLITE Red Light Therapy Device. Its one of the best product on the market right now and has been FDA approved already. Red is a very low wavelength color. When emitted directly on the skin, it has the ability to penetrate the skin to the extent of about 8 to 10 mm. There's no heat or pain involved, but the light goes to work, producing some benefits that in turn help the body heal, repair or recover. Red light therapy increases blood flow, increases collagen and also fibroblasts production. It also lowers oxidative stress and free radical damage. The therapy also can improve the efficiency of the body's lymphatic system which is responsible for removing toxic waste from the body. Research has also shown that red light therapy increases production of capillaries. Studies have also shown that one experiences rise in energy levels and also increased DNA synthesis levels after treatment. You can use red light therapy to treat joint pain, tissue damage related to strains, pulls or tears, osteoarthritic pain and any aches that you might have. Treatment often only takes minutes for an isolated spot on the body. However, if large areas of the body need treatment, treatment will take longer as most red light therapy devices can only work on a limited surface area at one point in time. As mentioned earlier, red light therapy is now an FDA approved treatment. You can read more about the FDA endorsement at the official FDA website, here. Not all red light is created equal. Even within the red light spectrum, there is a wide range when it comes to wavelength. Medical research has shown that a wavelength of about 650 nm or 820 nm is what is most effective when it comes to therapeutic capabilities. Hence, try to buy red light therapy devices that can offer those particular wavelengths. Every device will specifically mention how much of an area of the body can be covered by the device. This varies from device to device, sometimes very erratically. Try to look for devices that offer a fairly large treatment area surface as therapy can become a very time-consuming process if only a small surface area can be covered at one point in time. The higher the intensity, the faster your treatment can be, taking less time away from you. A higher intensity often also means that the surface area that is treated tends to be larger than a machine with a lower intensity. If intensity isn’t mentioned, look for advertised treatment times. If treatment time is mentioned as a minute, it means that the device has high intensity. It isn't red alone that is a therapeutic color! Green and blue light therapy often have their own benefits as well. There are some red light therapy devices out there that combine blue and green light therapy within their devices, giving you a versatile device that you can use for a lot more purposes. Most home red light therapy devices work on rechargeable batteries. Though battery life is quite extended, it makes sense to quickly look up a product’s advertised battery life, just to make sure that it won’t be one that will constantly require recharging or battery replacement. Also, keep an eye out to see if the therapy device will work only when plugged in. There are some devices out there that do this. If it is so, it can affect mobility and comfort as you might have to find a wall socket close to where you want to lie down or sit, make sure that the cord is long enough and so forth. Once you begin to use the red light therapy device, you will quickly begin to appreciate auto timer functions. If you want to take a nap while the red light therapy device does its work, you can set a pre-determined timer so the light will go off after whatever period you assign for the device. Also, look for mode options where the light is emitted in various ways. For example, some devices offer both a pulse mode as well as continuous mode, both of which are beneficial in their own ways. Now that you know what a red light therapy device can do and also have a fair idea of how to go about choosing one, we will introduce you to what we think are proven, time-tested red light therapy devices that are the best out there. We will make 5 recommendations to save you the hassle of scouring through hundreds and hundreds of devices available online. Here's a video that goes in-depth and talks about the top 3 benefits of Red Light Therapy! Right off the bat, the feature that makes this red light therapy device very popular is the fact that it is an FDA approved device. 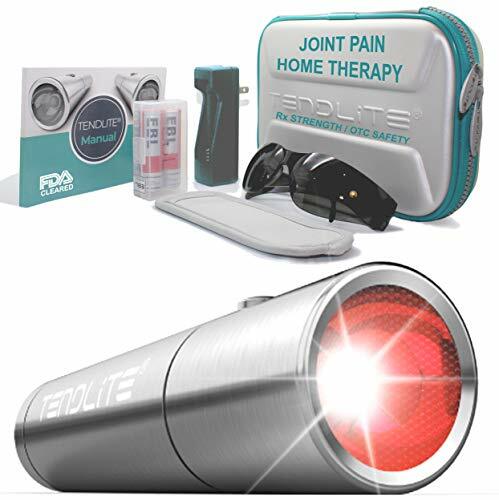 With a powerful, medical grade red LED light capable of outputting 660 nm wavelength, all you need is just a minute of light to treat a problem area such a stiff or aching joint. The device is made out of high-quality aluminum and feels like a premium device in your hands. Completely assembled in the USA, the device comes with a long 5-year warranty on the therapeutic LED bulb and a 1-year warranty on the device. This is a great device for muscle relaxation and to reduce joint stiffness. It also does a great job at increasing blood circulation. It comes with a rechargeable battery for cordless operation. Just 4’ in length, this is a very portable device, looking like a compact flashlight. You can take it on the go to even work should you want to, in your pocket. Like the above-mentioned TENDLITE device, this FIGERM device offers red light therapy with a therapeutic wavelength between 650 nm and 808 nm. What makes this product unique is that it combines acupuncture and another traditional Chinese treatment procedure into the massaging mechanism of the device, maximizing treatment. The device is ergonomically designed to treat your shoulder, back, and knee, parts of your body that very commonly need tending to. The device comes with a pulse mode and 4 modes of continuous operation. It also has preset timer settings that will allow you to set the device to run and cut off for between 10 and 30 minutes. When the device is running low on battery, it emits a helpful beep reminding you to charge it. Charging to full charge takes about 6 hours. The manufacturer claims that the battery will last 3 months, but you are more likely to charge it in about 2 months or maybe less if you use it very frequently. In the section where we talked about the benefits of red light therapy, we had mentioned that it increases collagen production and also increases blood flow. These particular benefits directly apply to how facial skin can be treated with red light therapy. People suffering from acne will particularly find this device useful as it has not just red light therapy but also blue and green light therapy on offer as well. The red light increases collagen production while the blue light can kill and cure acne. The green light can be used to fight premature aging and wrinkles. Therefore, this device can offer you intensive care for your face, using various types of light therapy. The manufacturer recommends that you use this device after you have applied a serum or moisturizing lotion on your face, preferably one that has Vitamin-C as an active ingredient, to get the most effective results. Why this device is specifically marketed as one that can fight acne is because it has a technology called Ionic technology, where a galvanizing action pulls out debris from within the pores, a problem that affects all acne sufferers. This is another very popular red light therapy device for the face. It can be used as a maintenance device to perform facial toning, face lifts, firming of the skin, to remove wrinkles and also to help fight aging and related problems. Unlike the previously mentioned facial red light therapy device, this one allows for cordless operation. It emits a 660 nm wavelength for therapeutic treatments. Since red light therapy is not recommended on the eyes, the manufacturer has thoughtfully included protective eye goggles that you can wear during treatment, to prevent any potential damage to your eyes. The device has a sensor that automatically enables red light when the head of the device touches the skin. It has a pulse mode and also a continuous function mode. You can expect to treat an area as big as 2’ inches x 3 inches’ with this device’s treatment head. This device boasts of a therapeutic red light wavelength of 660 nm that has been critically tested against intensive calibration methods. You can be assured that 660 nm is the exact wavelength you treat yourself with when you use this device to treat your pains and aches. The device runs on a rechargeable lithium-ion battery and takes about 5-7 hours to full charge. This is a very portable device that people with chronic pain problems can very conveniently use, pretty much anywhere they want to. Besides being very popular as a treatment device to treat muscle aches, joint inflammation, edema, and osteoarthritis, it is also very useful to treat sciatic pain. It has a built-in timer that will allow you to set a predetermined time and not worry about watching the clock to monitor the right dosage of light. Depending on the extent and severity of pain, one can use this device for 1 – 3 minutes, several times a day. While all 5 devices we have recommended are great products that offer great functionality along with durability and reliability, we would recommend the TENDLITE Red Light Therapy Device as the best red light therapy device out there. It has several things going for it. To begin with, it is an FDA approved device, a certification that is not lightly achieved. Then, the choice of the wavelength used by the device is bang on, at 660 nm. The device itself is built with very high-quality materials, using a stainless steel shell. The rechargeable battery lasts a very long time and charges up in just 5 to 7 hours. Treatment also requires just one minute. It can be carried very easily in a pocket, much like a pen, for treatment just about anywhere you go. This is one of the very few devices that come with a warranty. The LED light has a 5 year warranty while the device itself has a 1 year manufacturer's warranty. This indicates quality that is backed by an actual promise to replace the device, should something go wrong. If there were anything to complain about, we would say that the treatment surface area isn't anything spectacular. However, if you have just 3 or 4 problem areas in your body that you want to be treated, it won't take you more than 5 minutes to give yourself a great red light therapy treatment with this very popular device.